So I don't have Echo Park's new line Happy Days yet--can not wait to get my hands on that one! But I do have Country Drive and I have to say it is one of my favorite Echo Park lines. 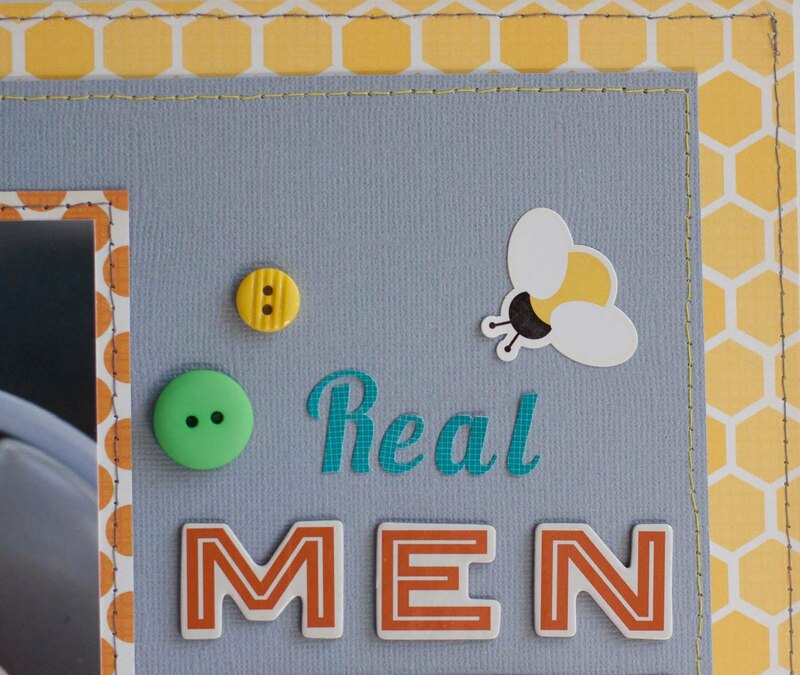 Not sure if it is the colors (yellow is featured prominently and I love to scrap with yellow) or the happy graphics--buzzing bees, vintage sunglasses and a cool green truck. Probably it is the fabulous combination of both. While I await the arrival of my Happy Days collection pack, I used a ton of Country Drive on several projects--enough that I may have to get another pack just to HAVE. Sick, but true. For some reason, I am not usually a fan of making birthday cards. 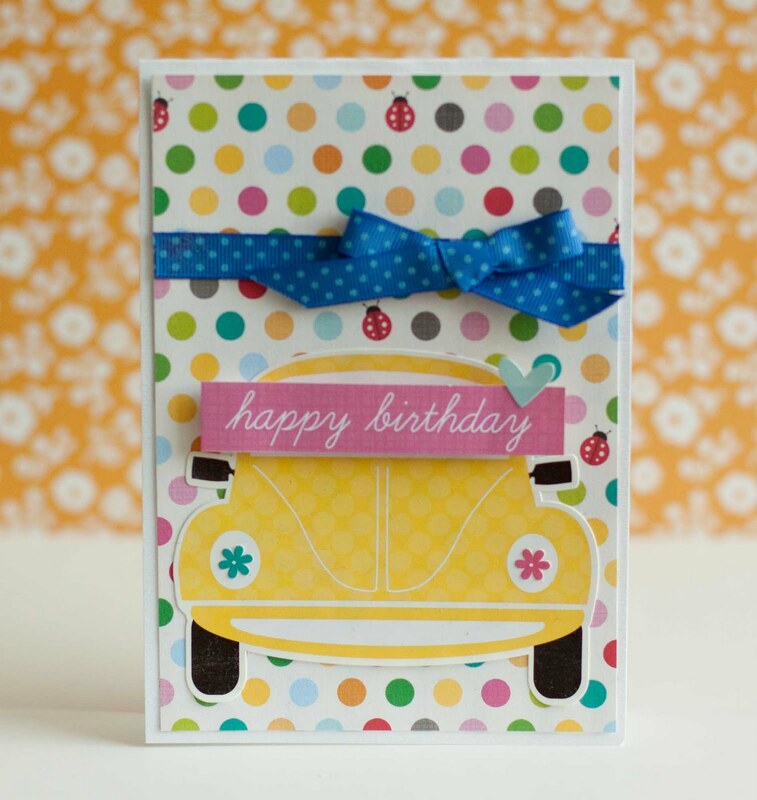 Maybe because they are so required I find them tedious, but this little number came together in a snap because I combined a Country Drive sentiment (popped up with Therm O Web Foam Squares), fun patterned paper and the cutest little beetle car ever. I loved adding the mini flower stickers to the headlights. Ok, so the cardstock and thread were from my stash, but everything else on this layout is from the 12x12 collection kit, including the patterned paper, stickers and journaling tag--love having everything all included. 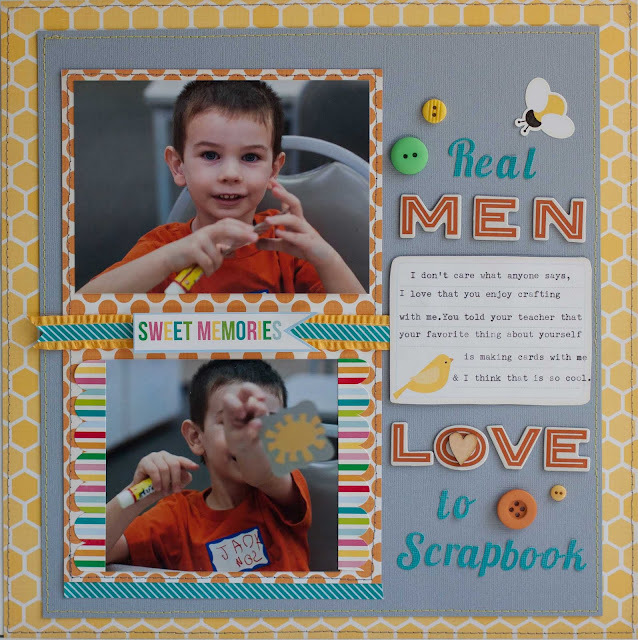 Truth be told, no one really gives me a hard time about Little Man and his craftiness, although I do get the occasional eye roll from Scott about how he is my little scrapbook buddy lol. Notice my typewriter is getting plenty of action? Love that little bee sticker. Funny thing is bees and wasps totally freak me out. I got stung once when I was completely minding my own business and a nasty yellow jacket or wasp was just feeling ornery so now they make me edgy, but little bee graphics are just so cute. Wanna know my new favorite way to adhere ribbon? 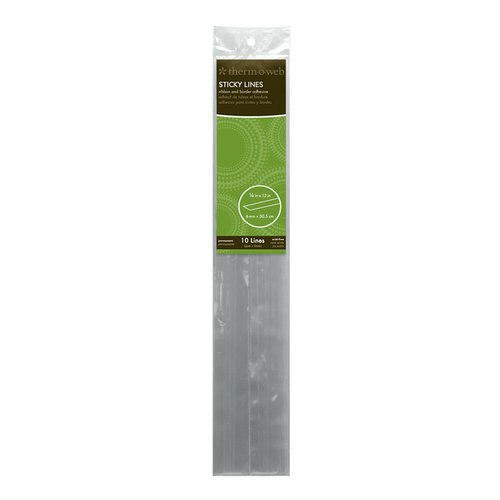 Therm O Web Sticky Lines. They seriously ROCK and make ribbon adhering easy and lasting. Ok, that is enough for tonight. Be sure to stop by tomorrow. 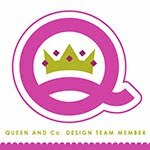 Best Creation Inc. is having a blog hop including stitched projects and my blog will be one stop on the way--there will be PRIZES! these are gorgeous Rebecca I especially love the stitching yo u have got going on with the bees , just soooo fab! Love these Rebecca! 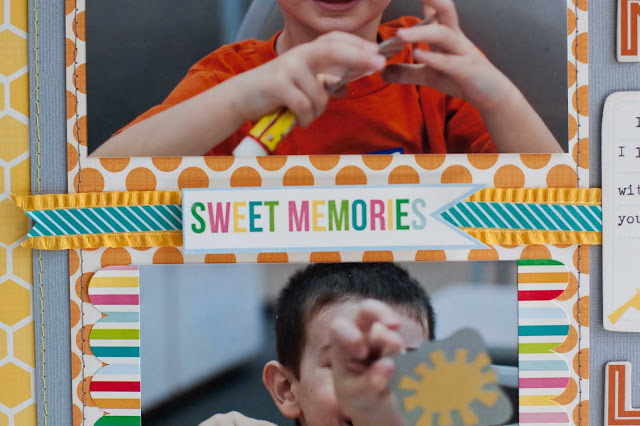 especially the one about crafting with your son... my boys all (used) to like crafting with me as well... now that they are tween/teens, no so much :) Enjoy it while you can! Love, love all your projects! Like very much the layout with the yellow stitching! 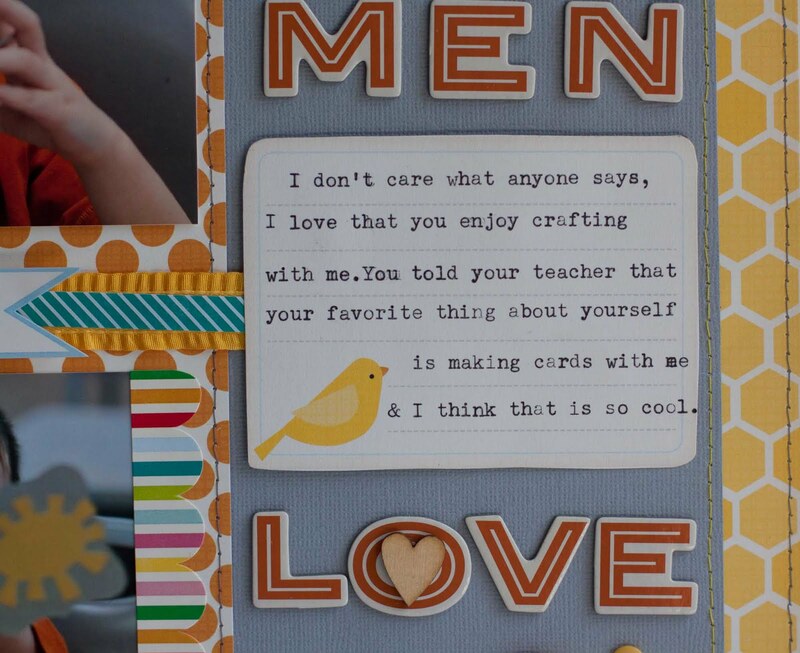 I will love to join us at Trail Makers for the birthday card with non-theme papers! 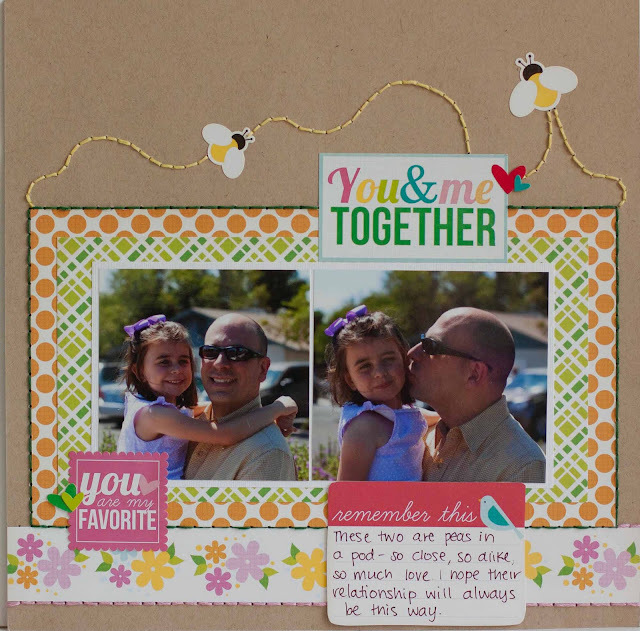 Gorgeous pages, I love those bright, happy colours and your stitching looks great! I love your EP Country Drive projects, Rebecca! Just gorgeous!!! I so totally need that hex-y paper! SO COOL!